The Ian Potter Foundation has been accused of political censorship after it withdrew support for ‘Terror Nullius’, an irreverent political film that it commissioned, on the eve of its release. In a statement, the Foundation, one of Australia’s leading arts funding bodies, said that it “[did] not wish to be associated with the marketing or publicity promoting” of Terror Nullius, describing it as “a very controversial work of art”. It did, however, add that all financial commitments to the project would be met in full and that it “does not want to imply that it has a position on the matters raised in the film”. The partnership between the Australian Centre for the Moving Image (ACMI) – where Terror Nullius is playing – and the Ian Potter Cultural Trust is one of Australia’s most significant long term commissioning programs supporting contemporary moving image art by Australian artists. The program awarded Soda_Jerk a commission worth $100,000 in December 2016, praising its ambition “to confront, poke at and recontextualize the clichés, stereotypes and overwhelming whiteness of our Australian cinema history”. Soda_Jerk, a multi-award winning and internationally acclaimed sister-duo, in turn pledged a work that would offer ”rouge remapping of national mythology”. The result is part eco-horror, political satire, and road movie. 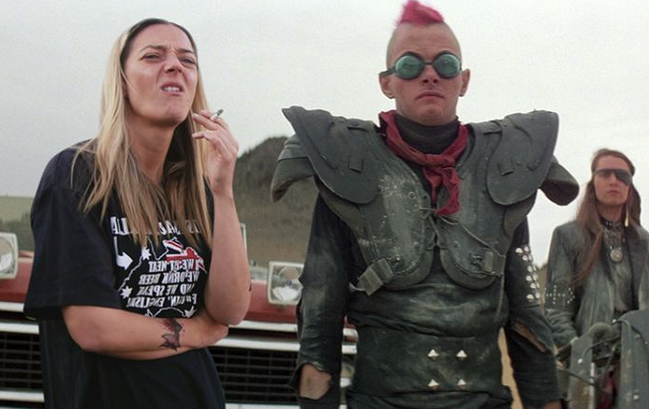 Terror Nullius is an experimental piece of film-art that confronts the horror of our contemporary moment and mocks the Australian national mythology. By remixing a chain of pop cultural and Australian film vignettes, the film explores the relationship between fiction and real world contexts while parodying and critiquing modern masculinity, Australian immigration policy, and the treatment of indigenous Australians. 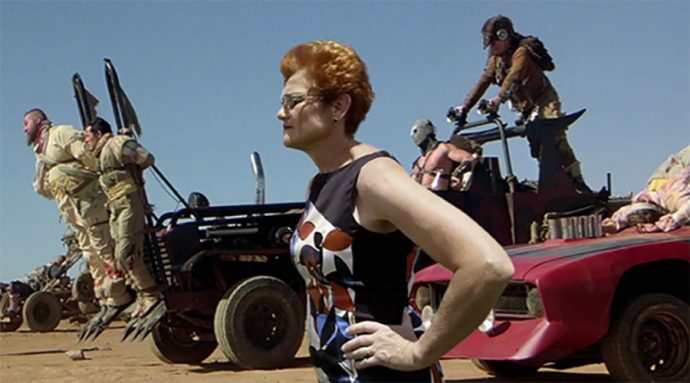 In one scene, Pauline Hanson stands shoulder-to-shoulder with Lord Humingus’s gang in Mad Max 2. 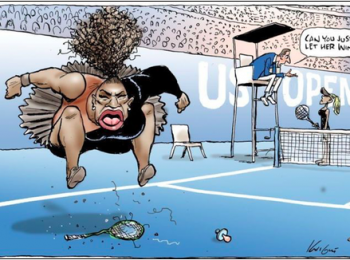 In another, she and Tony Abbot get whacked with lethal force by a boomerang while Skippy critiques the colonial narrative of Picnic at Hanging Rock, and scenes of Russell Crowe from Romper Stomper are interspersed with coverage of the Cronulla riots. Even the name ‘Terror Nullius’ is provocative. It rifts on ‘Terra Nullius’, a Latin expression meaning ‘nobody’s land’ that was key in the 1992 ‘Mabo’ case, where courts attempted to establish Australian land ownership rights by determining if Aboriginal land should be characterised as being “settled” (Terra Nullius) or “conquered” by the British. Soda_Jerk have expressed their disappointment at the Foundation’s decision. In a Facebook post, the duo accused the“conservative” trust of liking “the idea of a politically engaged work much more than the reality of one”. They also allege that representatives for Ian Potter called the movie ‘un-Australian’ – an accusation that the Trust denies. They expressed concern over the broader implications of the decision, which, they suggested, would “have a chilling effect on what Australian artists might dare to imagine and produce, in and for the future.” An appropriate concern for a work that fundamentally addresses how power and interest are intrinsically connected to the control and circulation of narratives. Private arts funding is increasingly a necessity in the wake of government funding cuts, though environmentally and ethically problematic sponsors have repeatedly caused international outcry. Soda_Jerk’s case once again draws attention to the problem of conflicting interest that arises.